When planning our spring break road trip to Grand Canyon National Park and Petrified Forest National Park, we were originally going to spend two days and three nights at Grand Canyon, but we ended up finishing everything we wanted to do early and decided to adjust our schedule a little bit. We called our next hotel in Holbrook, Arizona to see if we could come a night early, and when they said yes, we checked our of our Grand Canyon hotel, Yavapai Lodge, early. This gave us an entire extra half-day to explore the town of Holbrook before heading over to Petrified Forest National Park, which was awesome because it’s an neat, old, slightly run-down Route 66 town with loads of dinosaur statues! After a good night sleep, we grabbed some breakfast and headed out to explore historic Holbrook before I had to be back at the hotel to host a live Q&A call for my course Profitable Project Plan! When we were driving through town, we saw a big collection of dinosaurs sitting right by the side of the road, some almost 25 feet tall! 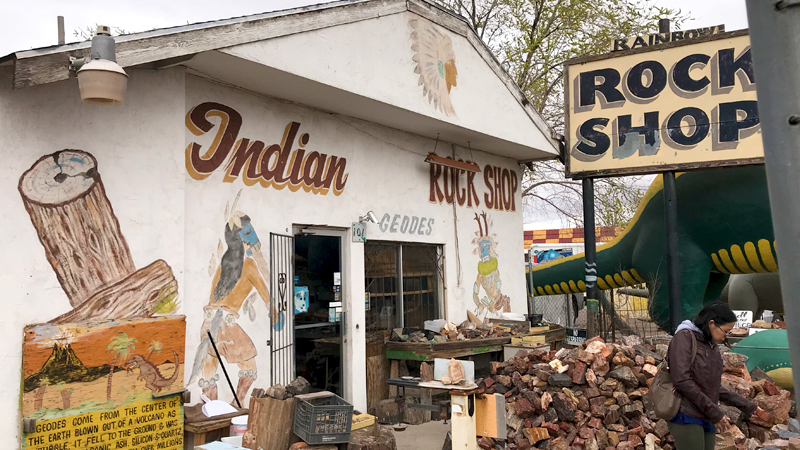 The Rainbow Rock Shop, also called the Indian Rock Shop, sells rocks, fossils, geodes, petrified wood, and other gifts and souvenirs, but it’s famous for a collection of seven giant cement dinosaurs that line the street in Holbrook, Arizona. The minute we saw those dinosaurs, we all wanted to check them out. We pretty much leapt out of the truck to gawk at these weird roadside attractions and snap some photos. While the dinosaurs were definitely cool, the rest of our experience at the rock shop was a little… off. The property and dinosaurs are surrounded by chain-link fencing and barbed wire, which isn’t at all inviting, but I get that with big piles of petrified wood and rocks outside, you’ve got have a way to keep people out when you’re closed. After snapping photos with the dinosaurs, we meandered through the large petrified wood piles and rock displays for quite a while and never once did anyone say hello or ask us if we had any questions. Then, when we went inside, one cashier was working who didn’t even acknowledge us until Natalie wanted to buy a few items. Bottom Line: If you’re looking for good prices on Arizona Petrified Wood, you’re into finding roadside oddities, or you have kids who like dinosaurs, the Rainbow Rock Shop is worth a stop. Rainbow Rock Shop, also called the Indian Rock Shop, is located at 101 Navajo Blvd, Holbrook, Arizona 86025. It is on the west side of Navajo Boulevard, which is also HWY 77, just south of Hopi Drive, which is also US 180. The rock shop is open Monday through Saturday from 10:00 am to 5:00 pm. A couple signs are posted that says you have to pay for each photo you take with the dinosaurs, but we didn’t have to pay for any and we even asked the man working at the register!